The Heavy Duty Electric Fillet Knife gives you more power resulting in incredible control when filleting even the biggest of fish. 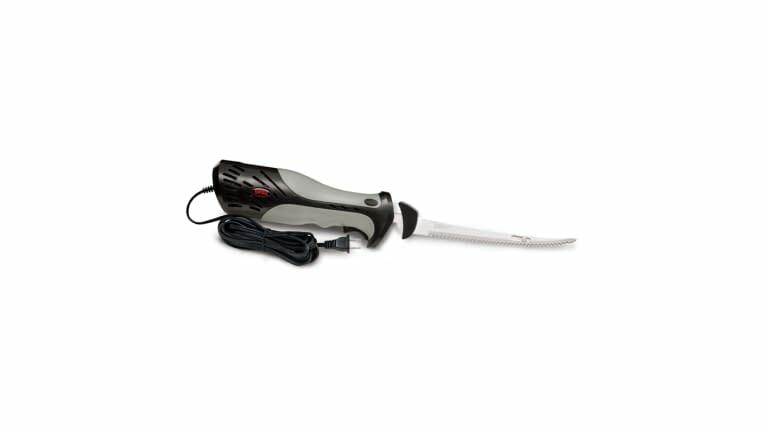 With twice the blade speed and three times the power of standard electric fillet knives you can easily cut through rib bones, backbones and make fast work of walleye, salmon, trout, and other large fish. Dishwasher safe 7-1/2" reciprocating style blade is included, the right size for almost all filleting needs. Vibration is dampened via the custom advanced air flow body design which also keeps the motor running cool and smooth. Comfortable, relaxed grip provides fatigue free filleting. 8-foot power cord gives you plenty of reach for working around the fillet table. By purchasing or ordering any knife you represent that you are 18 years of age or older and agree that you will take full responsibility for compliance with all applicable federal, state and local laws, regulations and other restrictions. Due to city and/or state regulations, Fisherman's Warehouse does not ship knives into the City of Chicago or the State of New Jersey.